There are 3 posts in this thread, and it has been viewed 2419 times. Mad Crasher. What do you think of it? 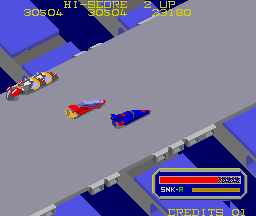 Now we're digging really deep into SNK's library of early pre-Neo Geo arcade games - let's go back to 1984, the same year when SNK released Vanguard II. Popular arcade games like Zaxxon, Q*bert and later even Marble Madness stood out by their use of isometric graphics, thus creating a three-dimensional illusion even though the pixel art still is in fact 2D. 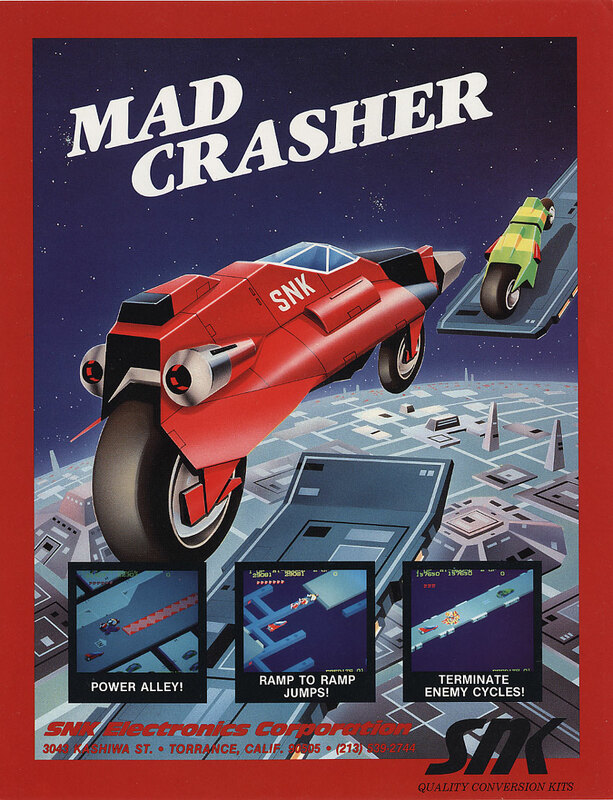 SNK jumped the bandwagon and brought out their own isometric but very simplistic racing shooter Mad Crasher, also known as Mad Crasher in Japan. Interestingly, the soundtrack was written by none other than Harumi Fujita, who later changed teams to Capcom and composed the music for top-tier titles such as Ghosts ‘n Goblins, Mega Man, Bionic Commando, Final Fight, and later even Pulstar and Blazing Star. You can read her funny remarks about her work on Mad Crasher and the other games in this interview. Taking elements from both driving and Shoot 'Em Up games, Mad Crasher tasks its players with maneuvering a futuristic motorcycle along a suspended track while opposing vehicles do their best to get in the way. 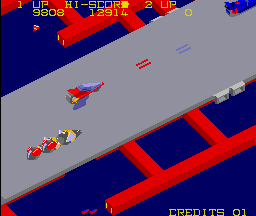 To help, the player's motorcycle is equipped with two additional abilities beyond directional control—jumping and firing laser beams. 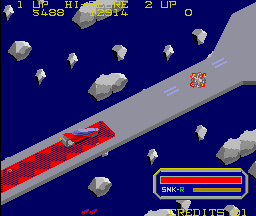 Though it can be used to avoid other vehicles as a last ditch effort to avoid a collision, the jump is mainly reserved for the track's many gaps and ramps, while the lasers allow the player to shoot down enemy cars for additional points. Scattered throughout the track are reddish power-up strips that give the player a speed boost of questionable usefulness, given that there is no real benefit of going faster. Like many games of its time, Mad Crasher is a pure high score chase without any explicit endgame. 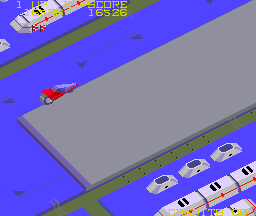 The player will receive a Game Over once all of their lives are depleted, which can occur from crashing into other vehicles or driving off of the oft-treacherous track. This game is fast, uncomplicated and easy to learn. Why not dropping in for a High Score Challenge? Please, if you have any interest please send a PM to Merlin or Priest and we'll put one up! Thanks a lot for keeping the GOTM feature going Murikov Haven't heard of this one before. Watched the video and it reminds me a bit of Galaxy 5000, a game I really enjoyed on the NES. Will give this a try on Mame. I've been impressed with the quality of SNK's pre-Neo-Geo games especially Beast Busters, Chopper I and Prehistoric Isle in 1930. Meanwhile I gave this game a try on Mame as well. It's really not that bad and very easy to get into. And to be fair, many arcade titles from the era were that way, so I can't blame SNK for anything. In this regard and context it's a decent game. But I still think that Prehistoric Isle in 1930, SAR - Search and Rescue or even Gang Wars are my favorite pre-Neo Geo games by SNK. These are really good titles, regardless of the time they came out. I love to read how unorganized and improvised the old days in the video game development industry seemed to be. I can't imagine a modern company in the size of SNK doing that nowadays, haha. And still the games turned out good and memorable. This is also something I read out from many interviews with former staff, that within the eras with less management and controlling the staff's creativity seemed to have flourished.